The Northern Virginia University Center was serving its purpose by providing educational opportunities that citizens of Northern Virginia previously lacked. However, extension education was not exactly the best solution for the entire population. While suitable for some citizens, it was not enough for others. Sooner or later the region’s serious college-bound students, many part of the postwar baby-boom, would need something more substantial. In January of 1954, the Advisory Council for the Northern Virginia Center was formed with Clarence A. Steele as Chairman. This sixteen-member group of citizens from Arlington County, Falls Church, Alexandria, and Fairfax County was commissioned to advise the University on the operation of the center and to explore the possibilities of its expansion to a branch of the University of Virginia. 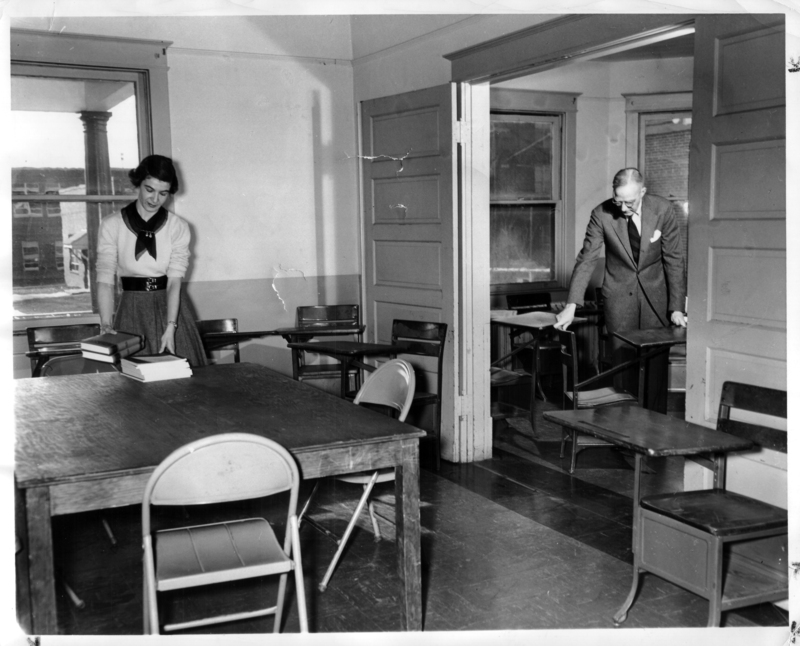 During its first meeting on January 4, 1954, the Council would discuss the merits of offering daytime classes for college-age students. But, more importantly, it began initial discussions on the creation of a branch college in Northern Virginia, whether under the auspices of the University or not. In May 1954 Council members met with President Darden to request formally that the University create a branch college in Northern Virginia. Darden was sympathetic but set conditions upon which it could act. He told them that funds for the maintenance and operation of a branch would have to initially come from the localities. The institution should initially be self-supporting. And the Advisory Council would have to inform the Governor and get his endorsement. All of these points were well within the reach of the Committee and the localities they represented, but the entire issue would be made more complicated by recent events. In late 1953 the Southern Association of Colleges and Secondary Schools (SACSS), the organization which governs the accreditation of higher educational institutions in eleven states including the Commonwealth of Virginia, changed a regulation regarding extension education. The new rule permitted accredited institutions to allow only one year of classes to transfer toward a bachelor’s degree unless it came from an officially established branch of the parent institution. This change in the rule would force the University to expand their operations in Northern Virginia if they hoped to continue to serve the area. The Center would need a permanent facility, a library, a full faculty, and would have to have a genuine connection to the parent institution In order to legitimately transfer two years of study from an extension center, according to SACSS. This meant that Charlottesville would need to establish a branch college, sooner rather than later, in order to meet these requirements. Also in 1954 the Virginia General Assembly attached to the 1954 Appropriations Act a rider that prohibited the establishment of branch colleges without approval of the state legislature. The rider was enacted both to limit the growth and cost of education institutions and to give the legislature more say in their operations. Because of this new limitation, the University of Virginia and Northern Virginia leaders would need to lobby the General Assembly to get approval for this expansion. It also meant that college proponents might have to wait up to two years until the 1956 General Assembly session to petition it since the Assembly only met for one month during odd-numbered years and two months during even-numbered years. C. Harrison Mann, Jr., of Arlington would lead the effort in the House of Delegates, after his election in 1954, and Charles Fenwick, also of Arlington, would work to secure support for the branch in the Virginia State Senate. Later that year, the Virginia Advisory Legislative Committee, which was composed of members of both houses of the Virginia General Assembly, conducted a study on higher educational opportunities in the Commonwealth and issued the report: The Crisis in Higher Education in Virginia and a Solution. The report, published in 1955, recommended the establishment of two-year branches of the larger institutions in Virginia in areas of the state where no such facilities existed, giving college-aged men and women an option to stay in state for at least the first two-years of their education. A contributor to the report, Dr. Lorin A. Thompson from the University of Virginia, would later become Chancellor of George Mason College in 1966 and the first president of George Mason University in 1972. Delegate C. Harrison Mann, Jr., and George Zehmer participated in the VALC's report as subcommittee members. Browse items relating to the Advisory Council for the Northern Virginia Center. Browse items relating to the year 1953. Browse items relating to the year 1954. John N. G. Finley, "Minutes of the meeting of Advisory Council January 4, 1954," Clarence A. Steele papers, Collection #C0056, Special Collections and Archives, George Mason University, Box 1, Folder 1.